When the weatherman started warning us about a bad ice storm, we joined everyone in north Texas at the grocery store, clearing out the bread and milk shelves in preparation for several days of being stuck at home. 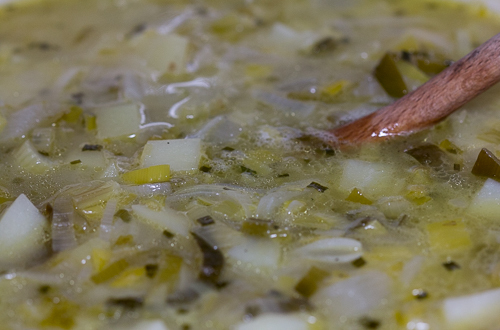 In the fresh fruit and vegetable section, the pile of huge leeks called me over and spoke to me of yummy leek and potato soup. I picked up a big bunch of leeks, a big yellow onion, a pound of white potatoes, and then headed to the meat section where I picked up a package of chopped pancetta. This is the perfect recipe for a cold winter day! Serves 8 to 10 hungry souls. Fire up a big chimney filled with charcoal. 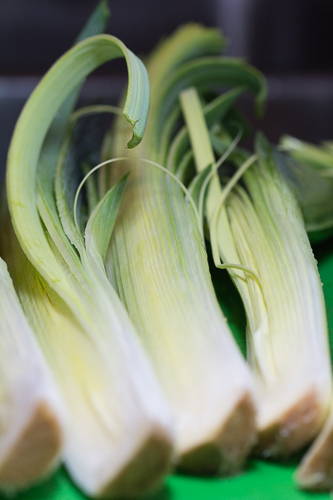 While the charcoal is getting happy, wash the leeks. I trimmed the green ends and sliced off the root, then sliced each leek length-wise and placed them in a big pot of cold water. Check out Alton Brown’s video and photo slide show for details. 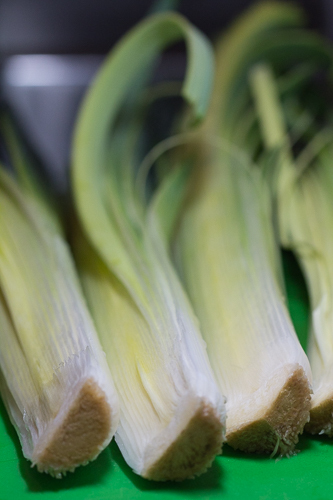 I then sliced all of the leeks, green part included, into thin ribbons. 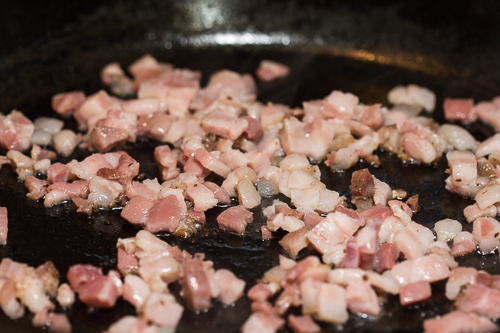 Fry the pancetta over a pile of hot charcoal in a 12-inch camp Dutch oven until it is crispy. Add butter, sliced leeks, and chopped onion and saute for 8 to 10 minutes until the onions start turning translucent and the leeks soften up. 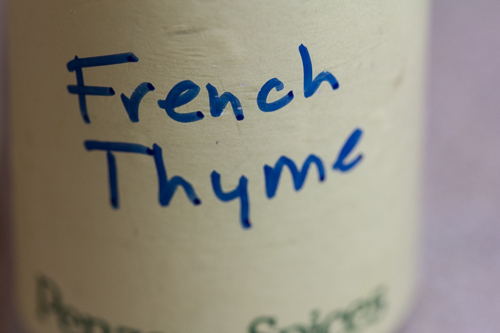 Add chicken stock, wine, chives, salt, pepper, bay leaves, and thyme. Bring to a slow simmer, adding more new hot charcoals underneath the camp Dutch oven as needed. Add potatoes. Simmer for another 10 minutes to let the flavors of the leeks get happy and for the potatoes to cook until they are soft. Taste the soup to make sure there is enough salt and pepper, adding more as needed. 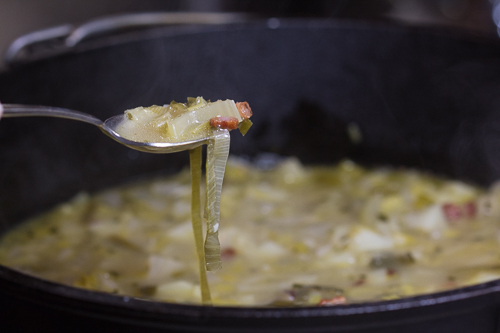 To thicken up the soup, smash the potatoes between a wooden spoon and the side of the Dutch oven and stir in the mashed potatoes into the soup. 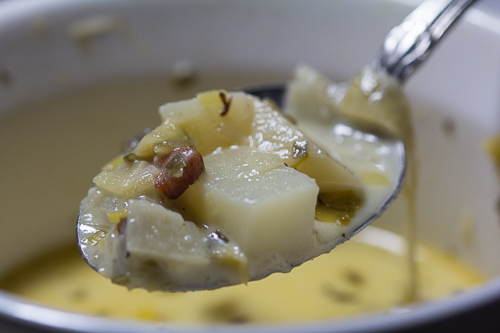 Repeat until you like the thickness of the soup but leave some chunks of potatoes to hang out with the leeks. Stir in the cream or half-and-half until it starts to simmer then remove the Dutch oven from the charcoal and serve. Wow, this is good! The bits of pancetta hang out in the background along with the white wine, adding a depth of flavor that makes the sweet leeks yummy. 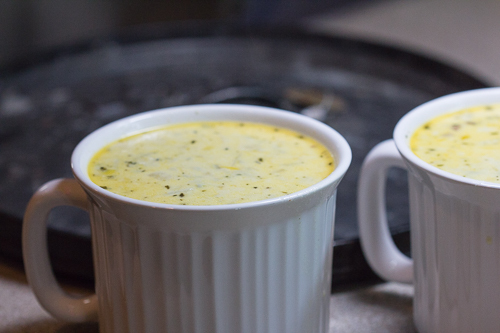 This is an easy recipe to make and is a perfect way to keep warm on a icy winter day. P.P.S. 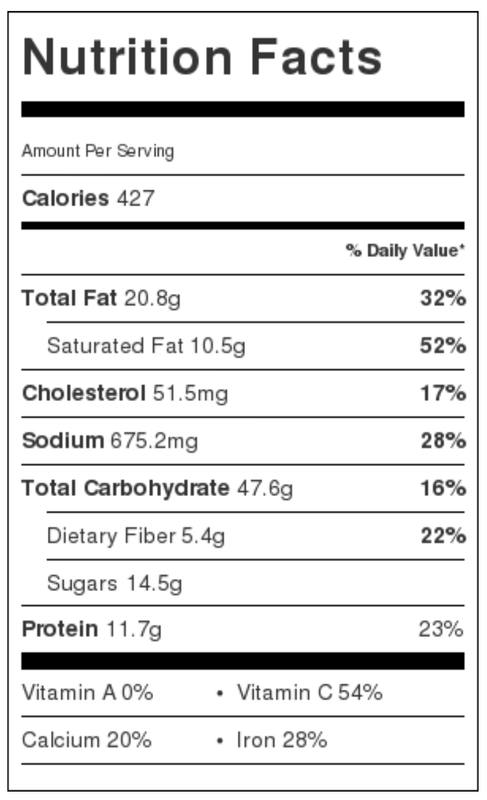 Check out the nutrition label! My very first time using the “label generator” on Food Blogger Pro!! YES I am excited and have used too many exclamation points but I don’t care – this is so cool! 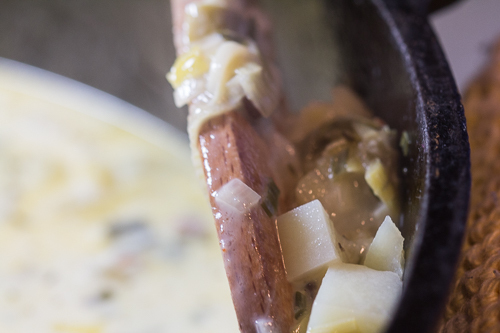 This entry was posted in Recipes and tagged 12-inch Dutch oven, easy, food blog, leeks, pancetta, potato, soup. Bookmark the permalink.